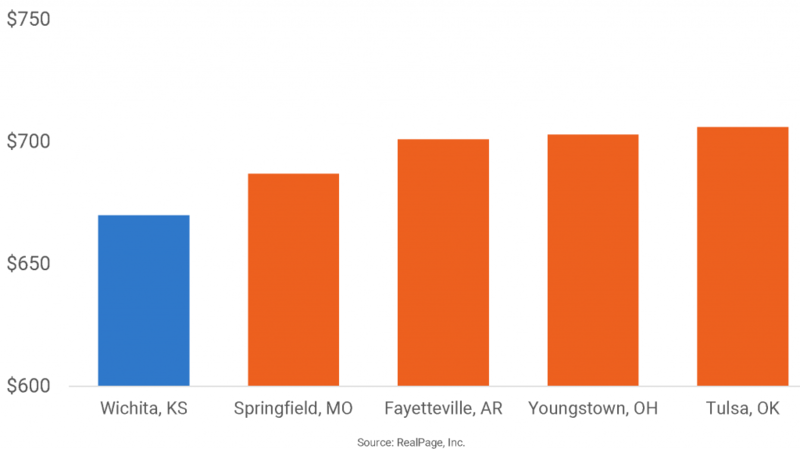 Among the 150 metropolitan areas that form the core of RealPage’s apartment sector coverage, the list of bargain-rent markets is led by Wichita, KS. Wichita’s monthly rents average just $670, versus the U.S. norm of $1,353. Wichita rent growth has proved sluggish of late. Growth in the past five years (2014-2018) averaged just 1.3%, with prices inching up only 0.3% specifically in 2018. Limited rent growth in Wichita reflects that the apartment occupancy rate is lackluster at just 93.9% at the end of 2018. There does appear to be some opportunity for market tightening in the near term, however. After a couple of years of economic contraction, mild job growth did return during the last half of 2018. Furthermore, with only about 200 apartments under construction, it won’t take much job production to generate the demand needed to absorb such small new supply. Other U.S. metros with notably low apartment rents include Springfield, MO; Fayetteville, AR; Youngstown, OH and Tulsa, OK.